In 1927 Robert Moses gave a speech on the future of Long Island to an association of real estate brokers. As reported in the Pulitzer Prize book The Power Broker, Moses said: " The Island was a gigantic cul-de-sac, a body with no outlet on its eastern end. Therefore, the Island is not a commercial community. Instead, it is a place for people to live and play, mostly play. It is a natural recreational community, the inevitable playground for millions of people in the metropolitan section. New roads, therefore, should be parkways designed to bring people from New York City for recreation and not for any other reason." 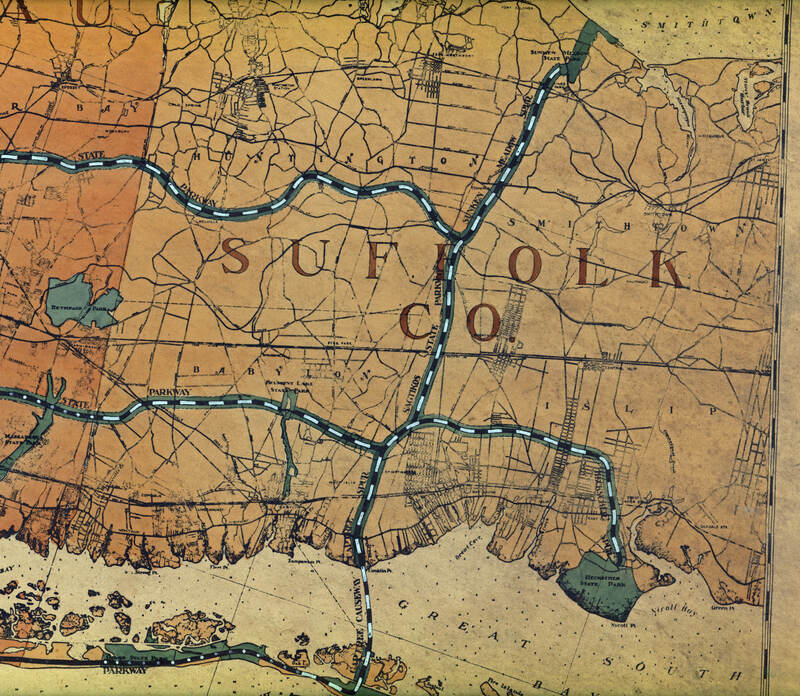 The 1931 planning map showed the routes of the current and future routes of Northern State Parkway, Southern State Parkway and "parkway spurs" to the Long Island state parks. 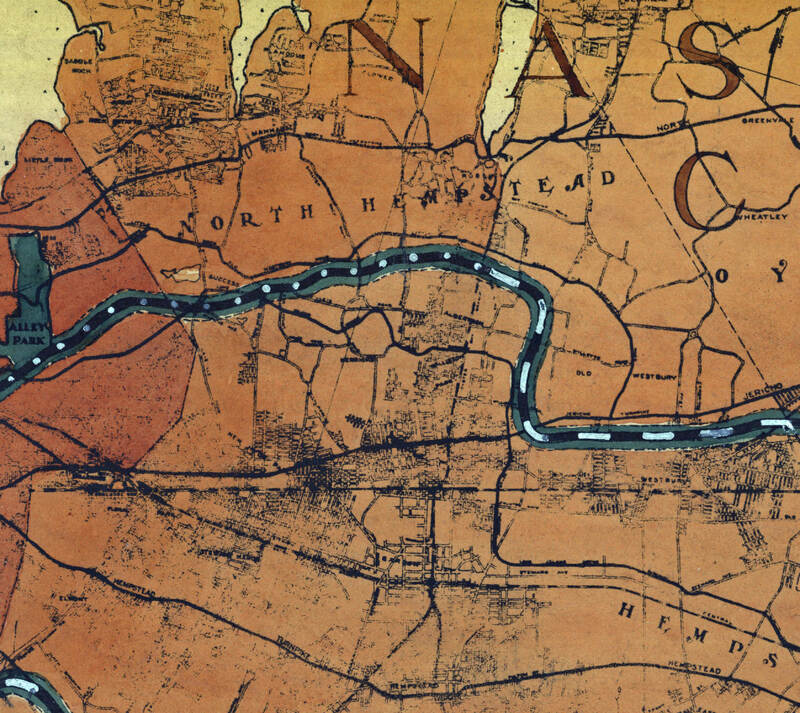 The map was dated December 13, 1931 with a key for an existing parkway (solid line), a parkway under construction (dotted line) and a proposed parkway (a dashed line). 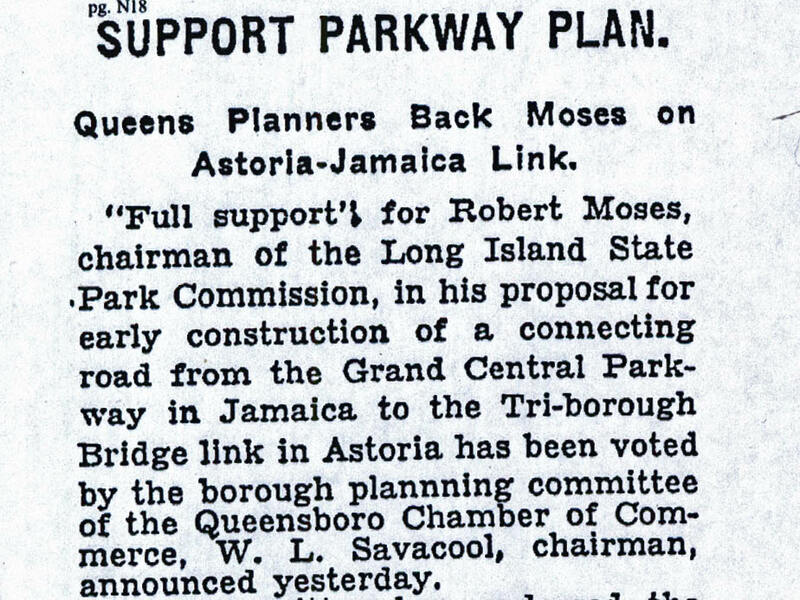 The New York Times reported on December 13, 1931 that "Queens planners back Moses on Astoria- Jamaica link." A close-up shows the proposed Grand Central Parkway extension to the Tri-borough Bridge. The proposal received full support by the borough planning committee. 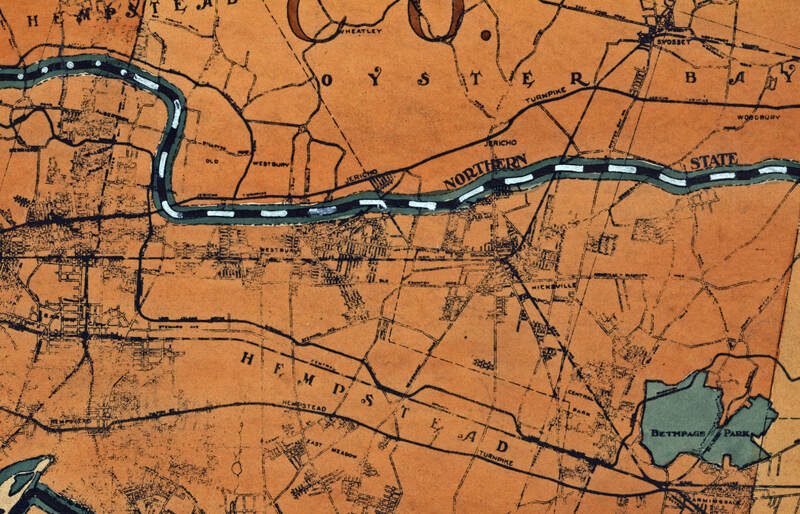 Section of the Northern State Parkway in Nassau County under construction (dotted line) and proposed (dashed line). Note in 1931, there were no plans to connect Northern State Parkway with the "Meadowbrook Spur" and the "Wantagh Spur". 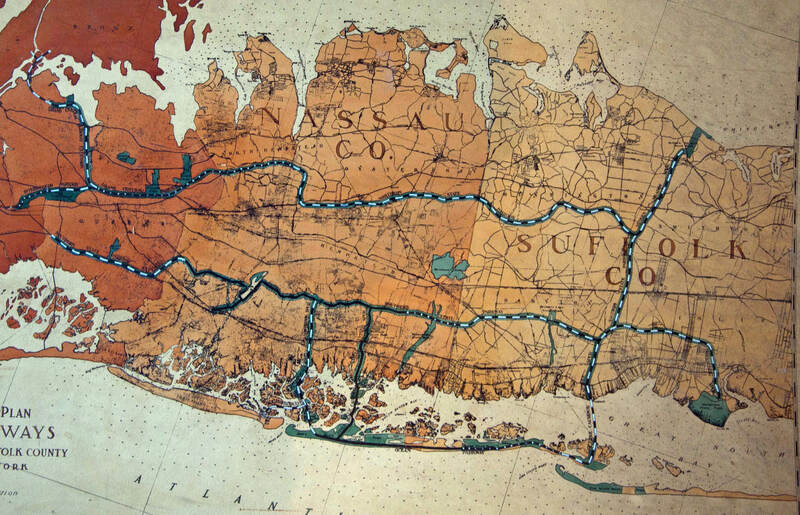 Look closely and you can find the Long Island Motor Parkway. 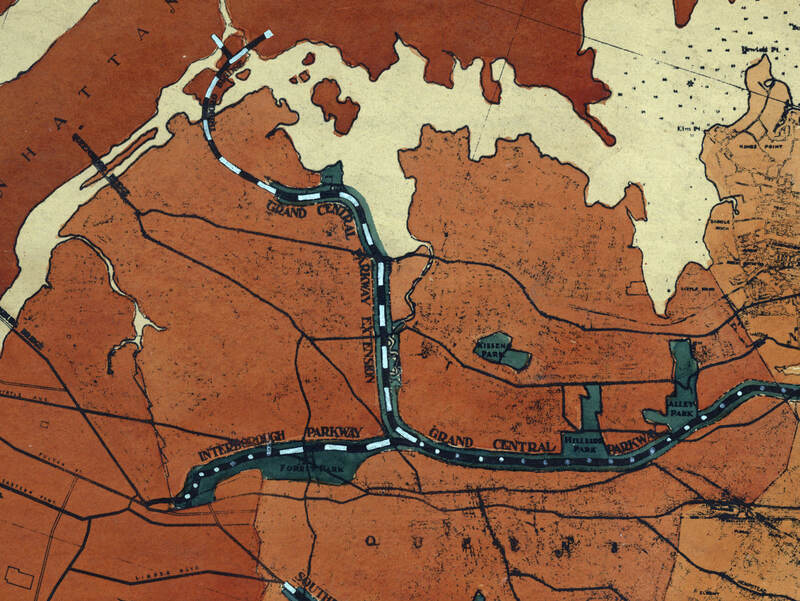 Note the Long Island Motor Parkway going throuugh the northern section of Bethpage Park. 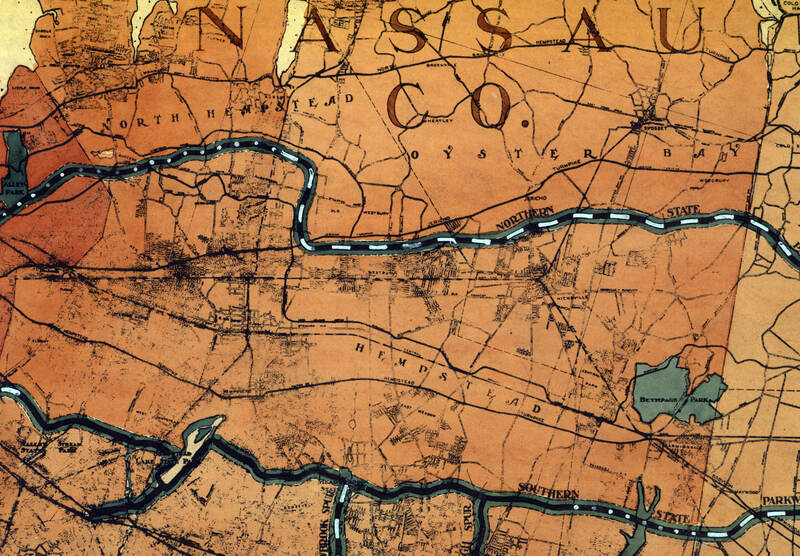 Sections of the Southern State Parkway and the "Wantagh Spur" (solid lines) were completed in 1929 connecting to Jones Beach State Park. The "Meadowbrook Spur" was still listed as proposed. 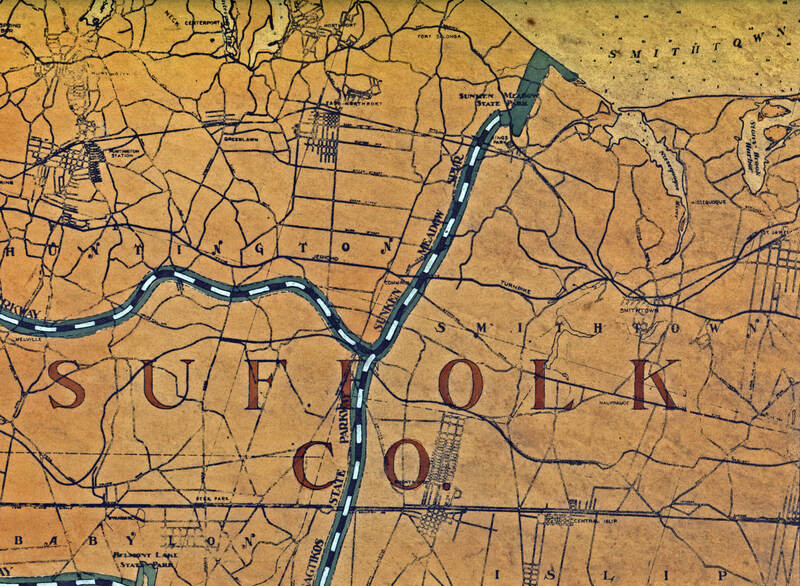 Most of the state parkways in Suffolk County were still listed as proposed. 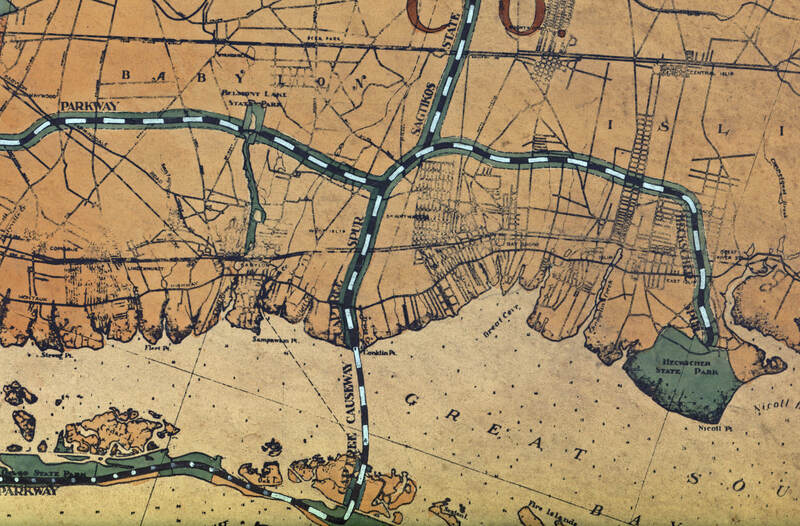 The proposed Captree Causeway and "Heckscher Spur". The causeway was completed twenty years later in 1951 and later renamed the Robert Moses Causeway. The proposed Sunken Meadow Spur to Sunken Meadow State Park. The Long Island Motor Parkway submitted by Sam Berliner III Posted 12/16/2014. Sam Berliner III: For my own amusement and for whatever it's worth, I took the three best shots and traced the LIMP RoW in RED for Central Queens, Eastern Queens-Nassau, and Suffolk (which doesn't quite make it to Ronkonkoma. 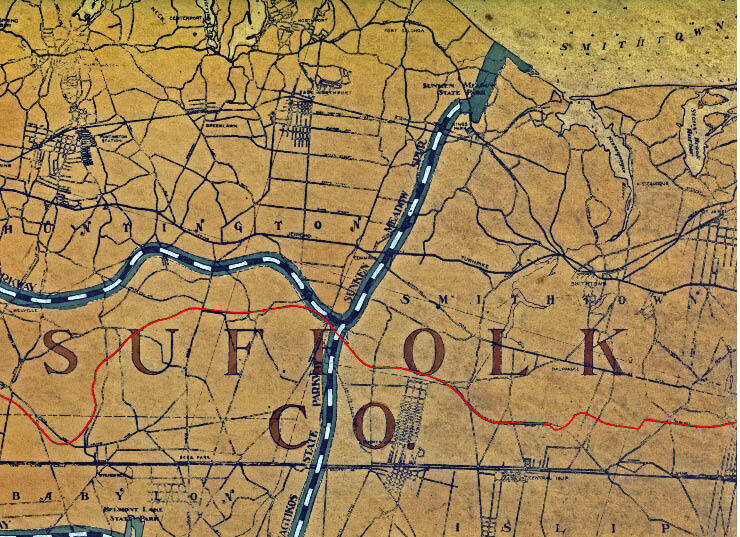 It's interesting to note that the LIMP is named in the Lake Success-Herricks-Williston area, along Stewart Avenue in Garden City, and in Central Park, but nowhere on the Suffolk section. 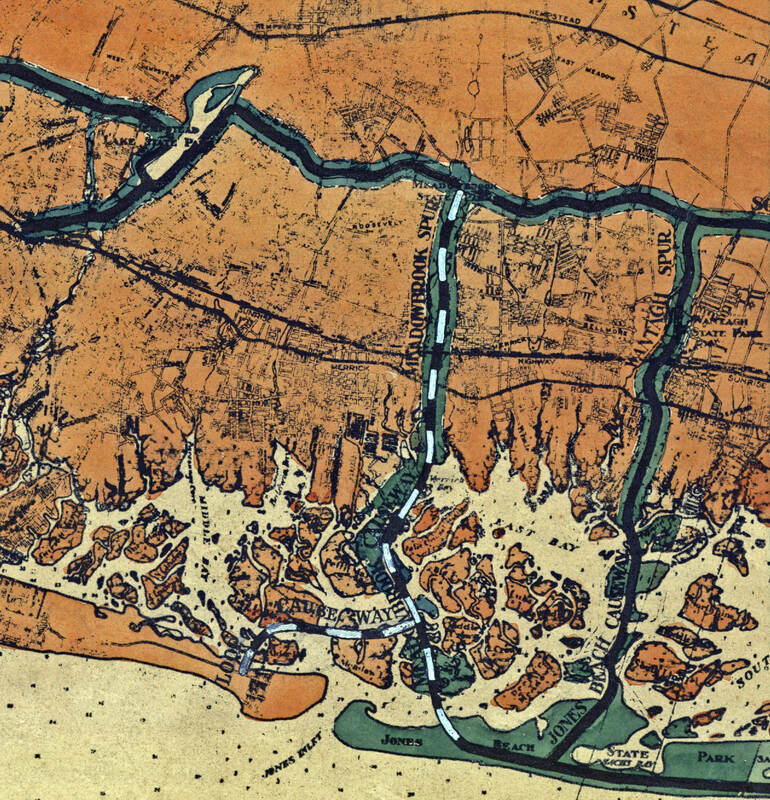 Love those old maps! Thanks. Howard: Thanks for the wonderful post. Hope all is well with you. Thanks for sharing this amazing map with us. 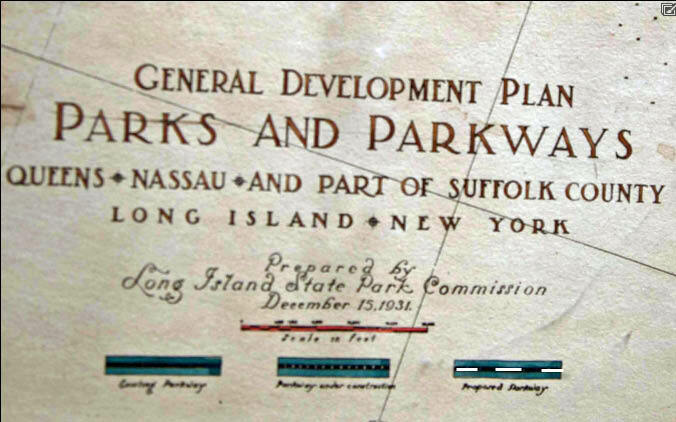 It is very interesting that as late as 1931, Robert Moses had not yet projected a parkway to what became the Bethpage State Park. 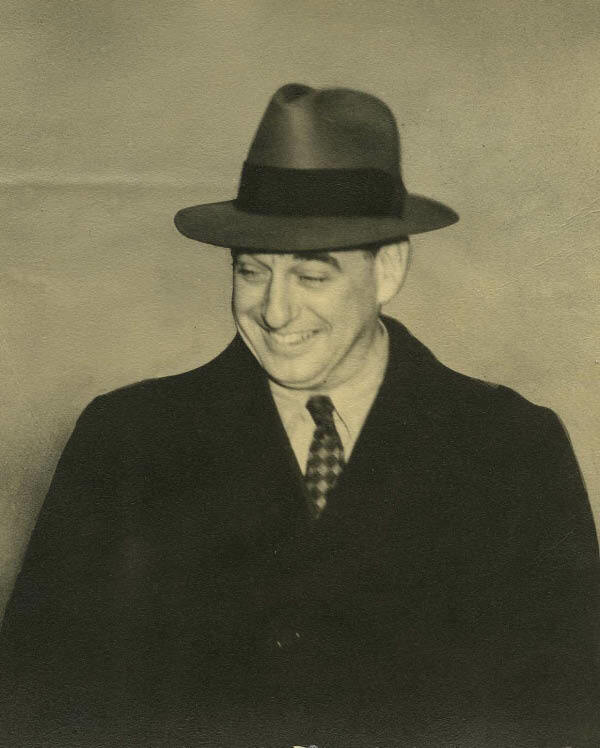 Robert Moses’ power and influence motivated the Town of Babylon to enact their first zoning regulations in 1931. These regulations were strengthened in 1954. Moses wanted strict local planning and zoning to protect his lovely parkways from intrusive development. It is also interesting how close the Long Island Motor Parkway came to the Bethpage Park. I grew up in Rockville Centre during the late 20’s and early 30’s and was familiar with “newness” of Southern State Parkway. Married and moved to one of Abe Levitt’s last homes built in Wantagh while working in Manhattan, Rockville Centre and Oyster Bay, so drove some of those early Moses efforts frequently. Awesome map Howard. I was expecting to see a proposed highway slipping through Fire Island as well but to no avail. Looking at all the current proposed projects already on the map, Moses must’ve had his plate full and Fire Island was not thought of yet.